An Optical Mirror Mount is a device used in optics research that securely holds a mirror in place while allowing for precision tip and tilt adjustment. Due to the sensitive nature of optics research, optical mirror mounts are typically mounted to an optical table to provide a high level of vibration isolation. Mirror mounts can be adjusted by hand with a adjustment screw. Adjustable or Kinematic Mounts are used to provide alignment or positioning capability to optical systems. 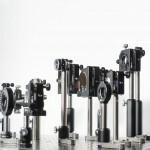 Adjustable or Kinematic Mounts are optical mounts that have been designed to feature a range of translation options.